Not to be confused with the short story of the same name by Robert A. Heinlein. 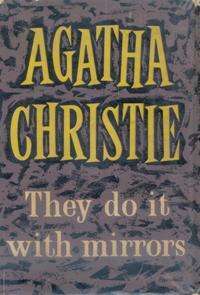 They Do It with Mirrors is a work of detective fiction by Agatha Christie and first published in the US by Dodd, Mead and Company in 1952 under the title of Murder with Mirrors and in UK by the Collins Crime Club on 17 November that year under Christie's original title. The US edition retailed at $2.50 and the UK edition at ten shillings and sixpence (10/6). The book features her detective Miss Marple. As the story opens, Jane Marple is paying a visit to her old friend Ruth Van Rydock. The two, along with Ruth's sister Carrie Louise, were all friends together at the same school in Italy when they were young women. Ruth, a wealthy, oft-married socialite, is worried that something is very wrong at Stonygates, the Victorian mansion where her sister, Carrie Louise, lives with her husband Lewis Serrocold. She can't explain any real reason for these worries, but she fears that Carrie Louise may be in danger of some kind. Ruth asks Miss Marple to visit her and find out what is going on. Carrie Louise is delighted to have Jane Marple for a visit at Stonygates. The old Victorian mansion, though owned outright by Carrie Louise, has been converted into a home for delinquent boys which is run by Carrie Louise's husband, Lewis Serrocold. Lewis Serrocold is actually Carrie Louise's third husband; she was also once widowed and once divorced. Carrie Louise has always been attracted to men who had their minds on noble causes. Her first husband, Mr. Gulbrandsen, was a great philanthropist, and Mr. Serrocold is devoted to the idea of reforming juvenile delinquents and teaching them how to contribute to society. The boys are involved in theatrical productions and many other activities around the estate during the day, but at night they are confined to their own quarters. The family has the central block of the house to themselves. The family includes many people who are connected to each other only through Carrie Louise. Mildred Strete is the only blood relative of Carrie Louise who is resident at Stonygates. She is Carrie Louise's daughter by her first marriage. Carrie Louise also had an adopted daughter, Pippa, who died after giving birth to her own daughter, Gina. Now an adult, Gina is married to an American named Walter Hudd and has recently returned to Stonygates. Juliet Bellever (nicknamed Jolly), a long-time companion, caretaker, and friend of Carrie Louise is also a permanent fixture at the mansion. Stephen and Alex Restarick, Carrie Louise's stepsons from her second marriage, are also frequent visitors. Also frequently present at Stonygates is Lewis Serrocold's assistant, Edgar Lawson. Edgar is an awkward young man whom the others dismiss as pompous and half-mad. He seems to suffer from both a persecution complex and delusions of grandeur. On several occasions he confides to others that he is the illegitimate son of a great man, and claims that powerful enemies are conspiring to keep him from his rightful position. Christian Gulbrandsen, a member of the Stonygates Board of Trustees and the son of Carrie Louise's first husband from his previous marriage, arrives unexpectedly to see Lewis Serrocold. Everyone assumes he is there on business, but no one is sure exactly why. After dinner, Mr. Gulbrandsen retires to the guest room to type a letter. Miss Marple and the others gather in the Great Hall. A fuse blows out, and Walter goes to repair it. Edgar Lawson bursts into the darkened room, screaming that Lewis Serrocold is his real father. Edgar and Mr. Serrocold go into the study and Edgar locks the door behind him. Everyone in the Great Hall listens intently as Edgar screams accusations at Mr. Serrocold, then they hear multiple gunshots. When the door is finally opened, they are surprised but relieved to see that Mr. Serrocold is alive and well, Edgar in tears, and several bullet holes in the walls. Yet there has been a murder at Stonygates that night after all. When Juliet Bellever goes to check on Christian Gulbrandsen, she finds him dead. He was shot while working at his typewriter, and the letter he was writing is gone. Lewis Serrocold later reveals to the police that he took the letter to keep his wife from learning its contents. He explains that he and Mr. Gulbrandsen were both concerned that Carrie Louise's recent poor health was due to deliberate poisoning. At that point, Alex Restarick, Stephen's brother (Carrie Louise's stepsons from her second marriage), arrives. He becomes the most likely suspect since the police who come to investigate find an unaccounted period of time between his arrival in the car and his appearance in the Great Hall. Alex Restarick's remarks about stage scenery lead Miss Marple to reflect on all kinds of stage illusion, such as conjurers who perform magic by using mirrors and stage sets and assistants who are in on the trick. When Alex and a boy who claimed to have seen something on the night of the murder are both killed, Miss Marple realises who has been behind the plotting at Stonygates: Lewis Serrocold, aided by Edgar Lawson, who is in fact Serrocold's illegitimate and unacknowledged son. The attempted poisoning of Carrie Louise never happened; it was an explanation hastily concocted by Serrocold to explain Christian Gulbrandsen's sudden appearance at Stonygates and his secretive conference with Mr. Serrocold. In fact, Gulbrandsen had discovered that Mr. Serrocold was embezzling from the Gulbrandsen Trust; Serrocold and Lawson killed him to silence him. The murder was accomplished via illusion and misdirection, as Alex Restarick and Miss Marple both eventually realised: "behind the scenes" of the interior of the house, which everyone had been focused on, there was a terrace by which someone could exit the study and re-enter the house to commit murder without being seen by the rest of the residents. This was what Mr. Serrocold had done, while Lawson, using his acting talents and different voices, had continued both sides of the loud argument by himself. When confronted by the police, Edgar Lawson panics and flees the house, jumping into an old boat in an attempt to cross a lake on the property. The boat is rotted though, and as it begins to sink, Lewis Serrocold jumps into the lake to rescue his son. Both men are caught in the reeds that line the lake, and drown before police are able to rescue them, bringing an end to the case. Maurice Richardson of The Observer of 30 November 1952 summed up thus: "First half is lively and the trick alibi for the murder of the stepson neat enough; there is a marked decline in sprightliness later on, but half a shot is better than no dope." Robert Barnard: "Unusual (and not entirely convincing) setting of delinquent's home, full of untrustworthy adolescents and untrustworthy do-gooders. Christie not entirely at home, perhaps because she believes (in Miss Marple's words) that 'young people with a good heredity, and brought up wisely in a good home…they are really…the sort of people a country needs.' Otherwise highly traditional, with houseplans, Marsh-y inquisitions, and second and third murders done most perfunctorily. Definite signs of decline." 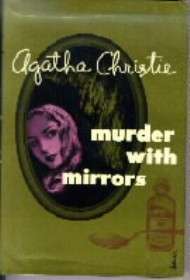 The novel's first adaptation was as Murder with Mirrors in 1985 for television with Sir John Mills as Lewis Serrocold, Bette Davis as Carrie Louise, Tim Roth as Edgar Lawson and Helen Hayes as Miss Marple. A second adaptation of the book was made for the BBC series Miss Marple starring Joan Hickson as Miss Marple, Jean Simmons as Carrie-Louise Serrocold, Joss Ackland as Lewis Serrocold and Faith Brook as Ruth van Rydock; first broadcast on 29 December 1991. The film was basically faithful to the novel, with the exception that Alex survives the attack on his life. Alex Restarick is replaced by Johnny Restarick, Stephen's father and Carrie Louise's ex-husband. Rather than arriving after the murder, Johnny arrives near the end of the confrontation between Lawson and Lewis and disarms Lawson, just before Mr. Gulbrandsen's murder is revealed. While Edgar Lawson's character and role in the murders remains unchanged, his death toward the end was changed slightly in two ways - firstly, he is exposed for his involvement in the murders by Miss Marple, rather than confronted by the police, and secondly, he doesn't use a rotted boat to escape, but merely attempts to swim over the lake on the property. Lewis' efforts to rescue him remain unchanged. Gina's real mother was changed for the adaptation - her name was changed to Katherine Ellsworth, and her death was explained to have been from a hanging, after she was found guilty of committing arsenic poisoning on three counts. Gina discovers this fact and exposes her connection to it, moments before Alex's death, and how she found it out is revealed, by Miss Marple's investigations, to be the fault of Mildred, who had resented her being given more attention than her. Everyone, bar Mr. Gulbrandsen, goes to the study to witness a dress rehearsal, not to the Great Hall, and so witness in person the confrontation between the two men. Lawson's reason for confronting Lewis is changed; he accuses Lewis of spying on him, rather than being his real father. Wally is made the initial suspect in the murder, owing to his absence to fix the fuses and the murder weapon being his. The police only begin to look elsewhere, and later to Johnny, when Mildred reveals the study has a secret passage that links it to the hallway; Miss Marple explains in her denouement that the passage was merely a red herring, before explaining Lewis' crimes. A new supporting character was included in the adaptation - Whitstable Ernest, a young man serving time for committing fraud and embezzlement. Ernest has a significant involvement in the adaptation, in that helped Lewis with his financial corruption in exchange for rewards such as oysters and alcohol. When Lewis knew that Mr. Gulbrandsen was going to expose him, Ernest torched all the records of his actions, which Miss Marple suspected when she smelt petroleum in the secret passage. When Johnny began to question Ernest, Lewis realised the danger he could create and so gave him oysters laced with arsenic; this did not kill him, but merely kept him out of harm's way (the adaptation had only two deaths, not three like the original plot). Some elements of the plot were also incorporated into the 1964 film Murder Ahoy!, which starred Margaret Rutherford as Miss Marple, along with a token tribute to The Mousetrap. Instead of a sprawling Victorian estate, the delinquent boys are housed on board a retired ship called the Battledore, and they go ashore periodically to commit mischief under the direction of their criminal mastermind. Apart from these elements, however, this film is not based on any of Christie's works. There is also a French television production. "Let Petits Meurtres d'Agatha Christie", season four. "Jeux de glaces", which literally means "Game of Mirrors". A condensed version of the novel was first published in the US in Cosmopolitan magazine in the issue for April 1952 (Volume 132, Number 4) under the title Murder With Mirrors with illustrations by Joe Bowler. In the UK the novel was first serialised in the weekly magazine John Bull in six abridged instalments from 26 April (Volume 91, Number 2391) to 31 May 1952 (Volume 91, Number 2396) with illustrations by George Ditton.